I'm enamored with the Deceptively Delicious cookbook by Jessica Seinfeld. I made the healthy mac & cheese again tonight, as well as another new recipe - Tofu Nuggets. As usual I found a way to make the recipe heart healthier and even more Weight Watcher friendly. The recipe can officially be my own version with props to the source (to whomever it might originally belong.) The recipe, like so many in this book is easily adaptable to whatever seasonings you have on hand and can be served with a variety of dipping sauces. You definately need to serve the tofu bites with a sauce; the outer coating is dry because you don't use any oil to fry the nuggets, hence they are not greasy or too moist. Line a baking tray or sheet pan with either parchment paper, aluminum foil or a Silpat. Spray the lined sheet tray with the non-stick cooking spray and coat well. In a shallow bowl or shallow baking pan, mix together the breadcrumbs, grated cheese, Italian seasonings, garlic powder, paprika, 1/2 teaspoon salt and 1/2 teaspoon freshly ground pepper. Beat the egg lightly and whisk in the Dijon mustard. Pour the egg mixture into another shallow bowl or shallow baking pan and stir in the spinach puree. Season with 1/4 teaspoon of salt and a dash of freshly ground pepper. Cut the tofu in half through its center to make two equal halves. Cut each half block of tofu into 1/2 inch cubes. 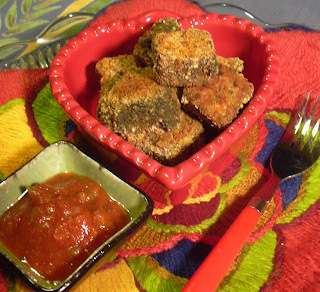 Dip the tofu cubes into the spinach egg mixture and the into the seasoned breadcrumbs to completely coat on all sides. 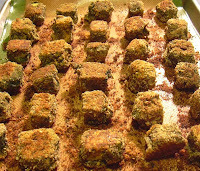 Place each coated tofu cube onto the lined sheet tray. When all the tofu cubes are completely coated and on the sheet tray, spray them lighlty with cooking spray and put the tray into the oven to bake. Bake for 10 minutes; rotate the tray and bake for another ten minutes. Remove tray from oven, and turn the tofu cubes over using tongs. Return tofu to oven and bake for another 10-15 minutes or until the tofu cubes are golden brown and crispy on the outside. Serve hot with marinara sauce, salsa, low-fat ranch dressing or honey mustard. Flavor options - Mexican - instead of Italian Seasonings, use Taco or Mexican seasonings and omit the Grated Cheese. Serve with salsa or a low-fat sour cream mixed with Taco or Mexican seasoning. Chinese - try using Chinese Five Spice Powder, omiting the cheese and Dijon Mustard; instead whisk into the egg and spinach puree a Chinese Mustard packet. Serve with Duck Sauce or Rice Wine Vinegar flavored with Soy Sauce and Chili Garlic Sauce.